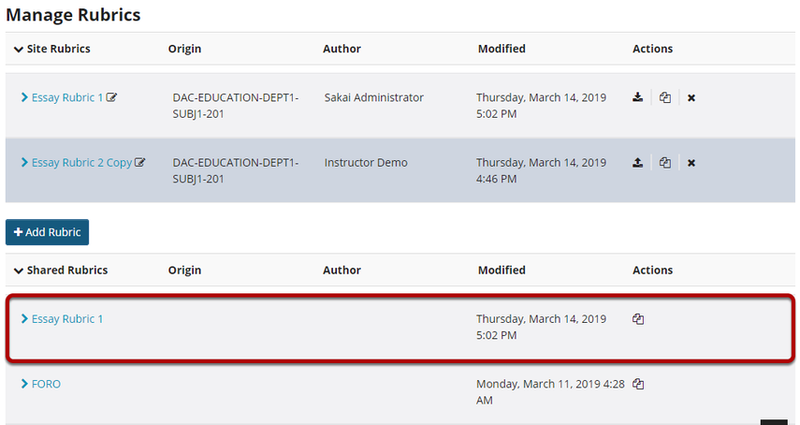 Sakai Community DocumentationSakai 19 User Guide (English) RubricsHow do I share a rubric? Select the Share icon [Share Rubric] for the rubric you would like to share. The rubric will now appear listed in the Shared Rubrics area. The rubric is now shared throughout your institution. Any user with the appropriate site permissions may copy the shared rubric into his or her site to use for grading or to make changes to their individual copy. Note: Shared rubrics may not be edited. If you would like to modify a shared rubric, you must Revoke sharing and make changes to your site rubric before re-sharing. Prev: How do I delete a rubric? Next: How do I stop sharing a rubric?